you are delighted because it's delicious! I really love it, that's such a beuatiful idea. If only I was able to stich I would do something like that! Your embroidery is really lovely and so well done. You're right about getting the jam and cream the right way round - very important! You can get non-reflective glass when framing embroideries or tapestries (or anything I suppose). Or you could get a box frame so the stitching is not in contact with the glass at all. That's so lovely Gillian... something to keep for ever. And I agree about the reflective qualities of glass. Framing it without is a good move, and I bet it was much easier to photograph too! Have you started a new tradition? They'd look great grouped together, all your holiday memories. Such a wonderful idea and so much better than a post card or holiday snap. Gorgeous! Magnificent. Such a personal reminder of your hols and so pretty too. Oh, that is so lovely and such a wonderful way to remember a great holiday. A very crafty young lady. 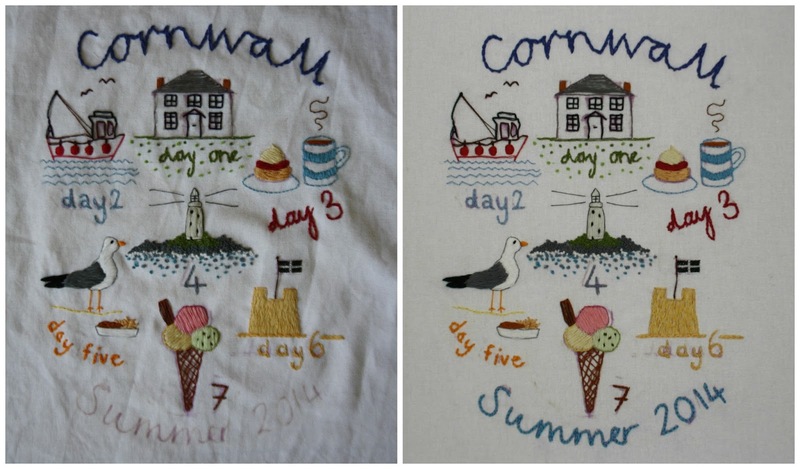 After the beautiful sunshine this afternoon here in West Yorkshire, you are giving me ideas about our holiday, but 7 weeks worth may be just too much for a small embroidery. (giggle). Take care. It's a thing of beauty Gillian. Imagine the amazing stitched memory collection you could have in a few years time! Precious memories captured with home-made skill and imagination-perfect, you will love it today but your children will appreciate it way beyond. hat a fabulous idea, thus bringing the memories of a fantastic holiday for indoors. You very creative and very good with your hands. It is just wonderful !!! Good idea to frame it without glass !! I always wanted to be one of those people who filled sketchbooks with drawings and paintings that I on holiday.This embroidery is even better and looks fun. 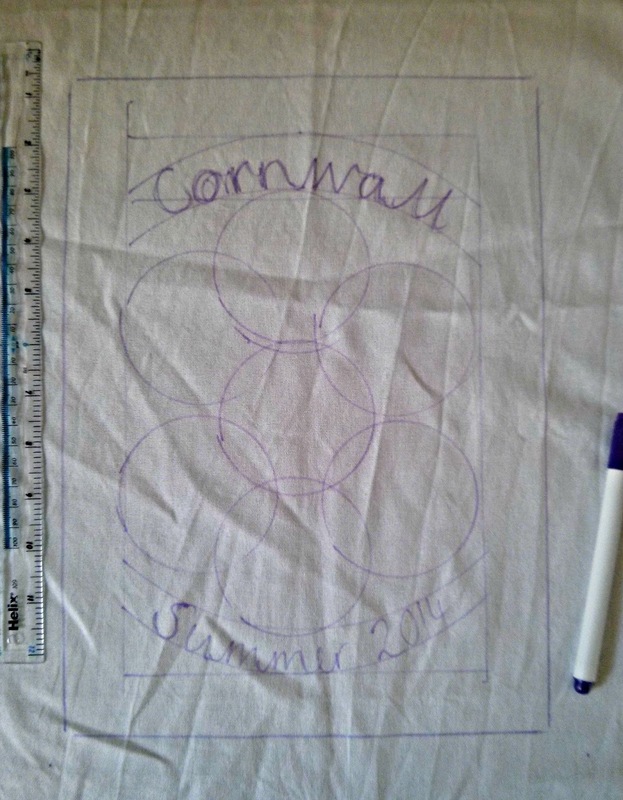 Sadly my needlework is worse than my drawing so I shall have to stick to buying a tea towel. Amazing, beautiful, stunning, wonderful, fantastic,... !!! It looks fantastic Gillian, loved reading the inspiration behind each memory. Did you purchase anything from Poppy Treffry? I've had my eye on a few things. Really pretty, and with a variety of stitches. I never developed my needlecraft, I was all fingers and thumbs, and still am when it comes even to putting a button on - husband does that! - so I do admire your needlework. It's beautiful and looks like a lot of intricate work, especially those french knots on the lighthouse. I think you're brave going without glass. I'm sure it will be much nicer. I wish I could, but things fade too much in my house so we use the UV glass. I love the cream tea and the lighthouse, Gillian and the French knots would've been squashed under glass. This collage is beautiful Gillian. You are right to frame it without glass front. I have an embroidery framed with glass and even though it is a special type of glass, it looses some of its beauty. I love the set of collages which show the inspiration for each day - brilliant! Beautiful and what a lovely way to remember your holiday. You are so talented. It is a beautiful thing! I love the idea and the final look, I seriously doubt I'd ever have time to make one of my own though, especially for a slow embroiderer like me. Slightly in awe over here! I thought it was amazing when you started this and its even more amazing now it's finished. I have a drawer with a pile of tea towels courtesy of my mother in law, they've never been used because I don't want to spoil them. Occasionally now, after many years, i'll use them to cover things i've baked and are waiting to cool in the kitchen. This is so beautiful! You are so very clever & creative. Thank you for sharing - your blog brings me much happiness. Just to add... thanks too for the "House of Cards" recommendation. We started watching it after I read about it here & have been absolutely addicted! Finished the second series last night but no idea how we'll bear the wait for series 3! Oh Gillian you clever creative lady, it's lovely and what a wonderful way to remember your holiday. Love all the textures, especially those little French knots. Enjoy the rest of the week. This is amazing!!! I've never seen anything like this before. I love the whole idea, the concept, and how you went about it to execute it. Thanks for all the explanations, it really adds something! This will be a treasured keepsake, I'm sure! You could tell a whole story in a book like that... just lovely!!!! I love it that you got your very own style and originality! Wow that is beautiful - you are very talented. I would love to learn embroidery - you have inspired me to try. Thank you for all the beautiful pictures, they are gorgeous. Absolutely stunning. I am very impressed. Gillian what a beautiful piece! Thanks for sharing! Suh a lovely reminder of a beautiful holiday. You should be very happy with it. I love embroidery but haven't done any for years! I haven't enough spare time to contemplate it during every day life, but I might think about it nearer Christmas when I need a relaxing experience. I LOVE your holiday diary - both the result and the memories it captures. Lovely blog post as well! It's absolutely beautiful Gillian! Something to treasure forever. It is a brilliant way to capture your holiday memories, it looks fantastic. It was interesting reading about the process of making it. It's fabulous Gillian! You're so clever; the embroideries are just lovely. Lovely, lovely, lovely and so well done Gillian! What a precious heirloom.